Tape the edges of the wall where it meets the trim. Stir the paint thoroughly with a stir stick. Never use paint until after you stir it. You’ll get bubbles and the color will be uneven. 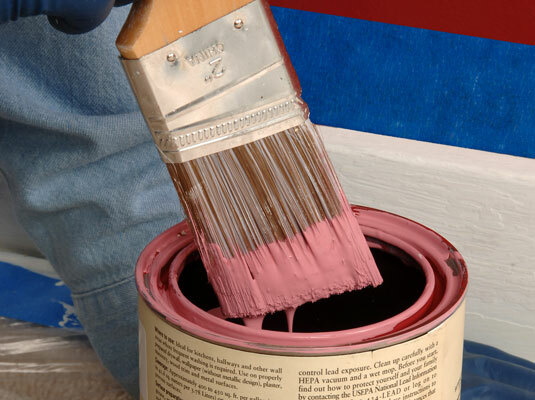 Dip a 2-inch angled sash brush into the paint can. Only load the top 1/3 of the bristles with paint. Remove excess paint from the sash brush. Tap both sides of the bristles on the can, and then wipe the bristles against the side of the can to remove any excess paint. If you overload the brush, you’ll lose control of the paint application. Position the paint guard at the side of the trim. 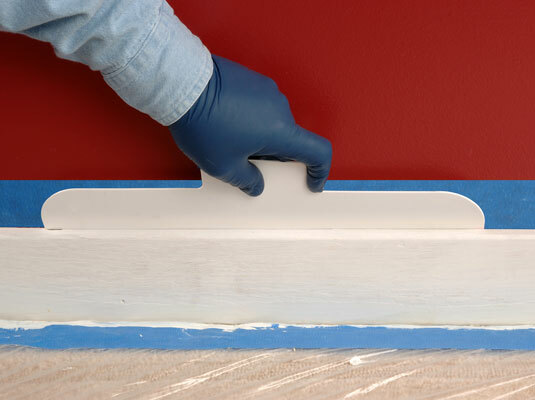 Position the paint guard at the bottom edge of the ceiling molding, at the top of the baseboard, or on the wall adjacent to window and doorframes. Hold the guard in your nondominant hand, using firm pressure to hold it in place. 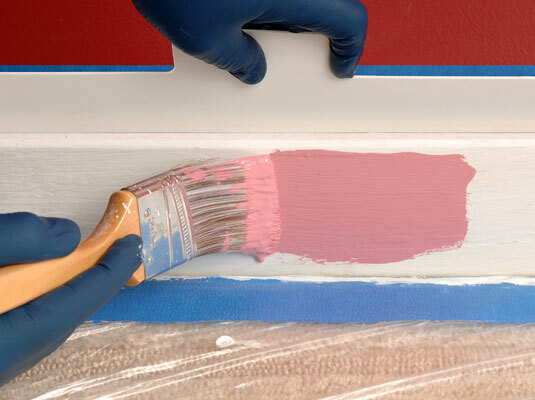 Apply the paint in one stroke in one direction on the widest part of the trim. 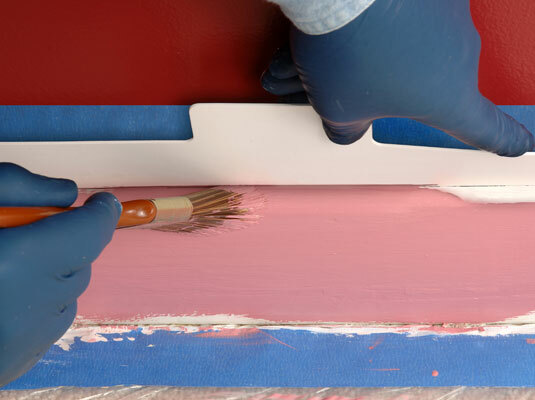 Press slightly — just enough to flex the bristles — and work slowly to ensure an even application of paint. Start subsequent strokes of the brush in a dry area, working toward the wet area. When pondering how to paint trim the best way, always consider this technique as it avoids creating lap marks. Raise the brush slightly and feather the edge. Feathering paint into a previously painted patch keeps the paint even and smooth from one stroke to another. Reverse the direction of the brush, and lightly stroke back over the coat you just applied. This technique will set the paint. 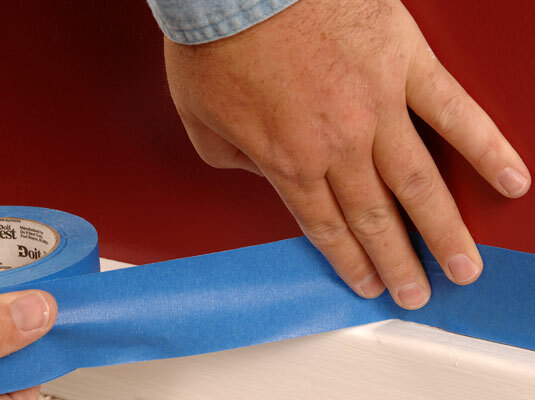 Apply the paint to the edges of the trim. In tight spaces, switch to using a stubby handled brush. Touch up the paint after the first coat has dried. 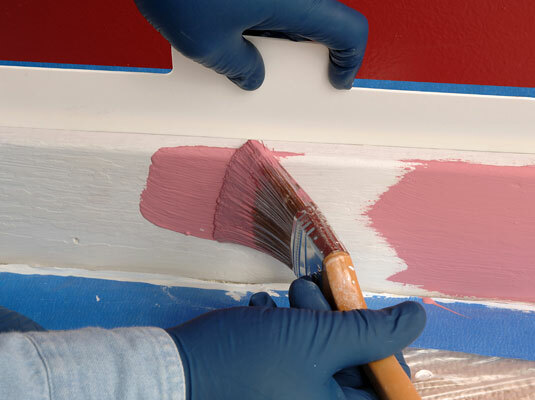 If you find that an area needs more paint, until the area is dry, then sand lightly, and touch it up.